The earliest and boldest use of the Moog in improvisational music was the work of Richard Teitelbaum (b. 1939), an American composer and co-founder of the free improvisation ensemble Musica Elettronica Viva (MEV). A New Yorker, Teitelbaum received a Masters degree in music from Yale in 1964 and headed for Italy on a Fulbright scholarship. He had grown interested in electronic music during the early 1960s, being influenced by the work of Karlheinz Stockhausen, John Cage, and the Italian composer Luigi Nono, with whom he studied. 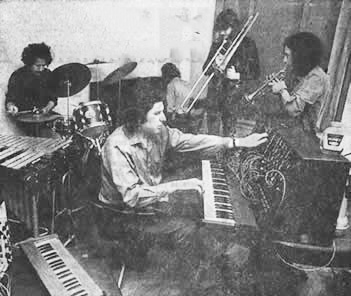 MEV was begun in Rome in 1966 and originally included Alan Bryant (electronics), Alvin Curran (piano, trumpet, voice), Frederic Rzewski (electronics), Ivan Vandor (saxophone), and Teitelbaum (Moog Modular and electronics). MEV occupied a place in music that was between experimental classical and jazz improvisation, members having had some experience in one or the other. On the jazz side, for example, Ivan Vandor had studied with Dexter Gordon. Saxophonist Steve Lacy, who worked with MEV in 1968 and then again in 1976-77, had also worked with Thelonious Monk and Cecil Taylor among others.1 Lacy, incidentally, experimented with tape loops of his saxophone and other sounds on his 1971 album Lapis, released in France by Saravah. 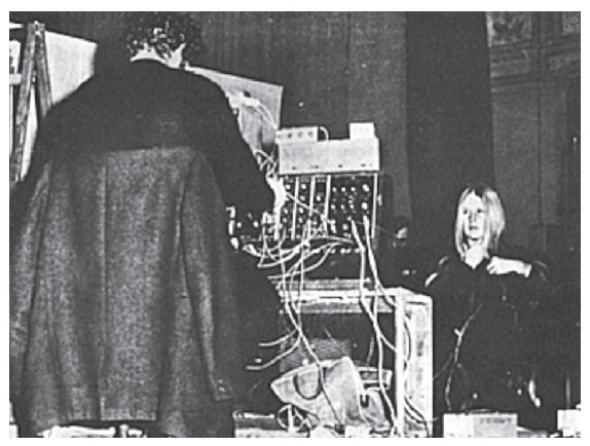 MEV, with Richard Teitelbaum in the foreground with his Moog Modular Synthesizer. Shuttling back and forth between the United States and Europe, Teitelbaum befriended Robert Moog in 1966 and engaged the inventors help in finding a way to amplify sub-audio brainwaves (alpha waves, around 8-12 Hz) to use as control voltages with the voltage- controlled Moog. Moog made for him a low cost, high-gain differential amplifier at the front-end of the system and also built a very good low pass filter at the end of the high-gain amplifier to further emphasize the alpha waves being amplified live from the brain.2 In the Fall of 1967, Teitelbaum made the down payment on a used Moog Synthesizer and returned to Europe with this equipment to rejoin MEV.3 He was the first person to bring a Moog Modular to Europe and was a pioneer in the use of amplified brainwaves for musical purposes. There, MEV performed dozens of concerts over a three-year period, often using the Moog-Teitelbaum biofeedback circuitry to process amplified brainwaves and other signals using the Moog Modular. Doing this in real-time was startling at the time, introducing biofeedback in the form of brainwaves, heart rates, EMGs, skin conductivity, and other signals into musical performances. Members of the audience frequently participated in the performances. Live Electronic Music Improvised (Mainstream MS/5002, US, 1968). The tracks found on these three albums capture, in part, the biofeedback performances. The result was music that explored remarkable textures, noise, and interaction between acoustic and electronic instruments. 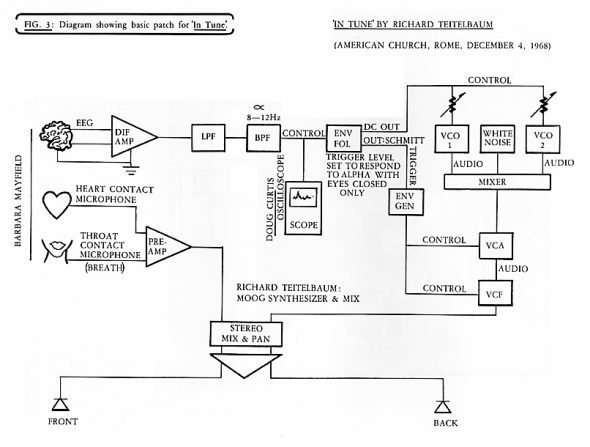 For the MEV piece Spacecraft, Teitelbaum used biofeedback signals of his own body and those of other members of MEV as live (real-time) musical materials.4 Their heartbeats, chest cavities and throats were connected to contact microphones, which he used as amplified audio. Electrodes were attached to their EEG and ECG, the signals for which were converted into control voltages of the Moog synthesizer using the black box that Robert Moog had created for him. The result was a combination of mindful musical actions by members of the group integrated with Teitelbaum’s signals from his own body. Teitelbaum could capture and repeat the biofeedback signals as a loop, then manually or automatically make adjustments to the output on the Moog. In Tune (1967) for brainwaves, heart beats, breath and Moog synthesizer. 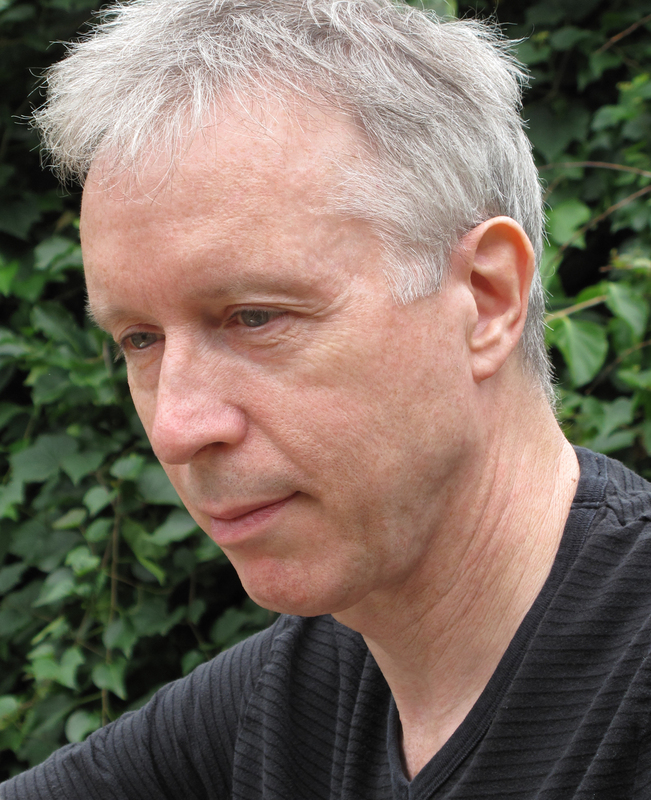 Richard is currently a composer, performer, and Professor of Music at Bard College. Teitelbaum has received numerous awards, included a Guggenheim (2002) to create his opera Z’vi, two Fulbrights, grants from the National Endowment for the Arts, New York State Council on the Arts, New York Foundation for the Arts, The Rockefeller Foundation, the Asian Cultural Council, and many commissions over the years. 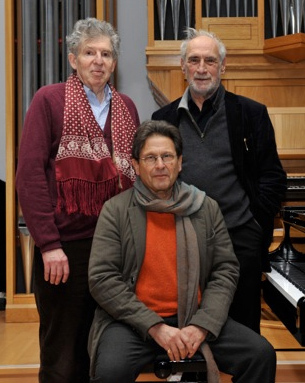 He has recently revived MEV with original members Alvin Curran, Frederic Rzewski. Look for one of their performances. 1 Teitelbaum, Richard. Personal communication, March 4, 2016. 2 Teitelbaum, Richard. Personal communication, March 4, 2016. MIT Press, 1976, pp. 35-56. 5 Teitelbaum, Richard. Personal communication, March 4, 2016.